Amitabh Bachchan : Rolls Royce Phantom, Mercedes SL500, Porsche Cayman S, Range Rover, Lexus LX470, Mercedes E 240, BMW X5,BMW 7 Series, Mercedes S320. Alia Bhatt : Owns a Milky white Audi Q5. Akshay Kumar : Porsche Cayenne: Grey Edition, Bentley Continental Open Door, Fiat, Mercedes and Honda CRV. Ajay Devgn : Ferrari Maserati, BMW Z4, Mercedes Z class and Range Rover and Modified Toyota Celica, Maserati Quattroporte, Range Rover Vogue, vintage 1967. Arshad Warsi : Audi Q7, Volkswagen Beetle. Abhishek Bachchan : White Bentley Continental GT. Aamir Khan : Bentley Continental, Rolls Royce Ghost, Mercedes Benz S600 Guard. Arjun Rampal : Porsche Cayenne. Anushka Sharma : Black Ranger Rover Vogue. Abhay Deol : Mitsubishi Pajero 4×4 Wheel Drive. Bobby Deol : Porsche 911 Carrera SS, 911 Carrera S.
Bipasa Basu : Audi Q7, Mercedes S class, Porsche Cayenne, Volkswagen Beetle. Deepika Padukone : Audi Q7, Mini Cooper. Diana Penty : Mini Cooper. Emraan Hashmi : Audi Q7, Audi A8 L.
Farhan Akhtar : Red Range Rover, Mercedes Benz, M350 CDI SUV. 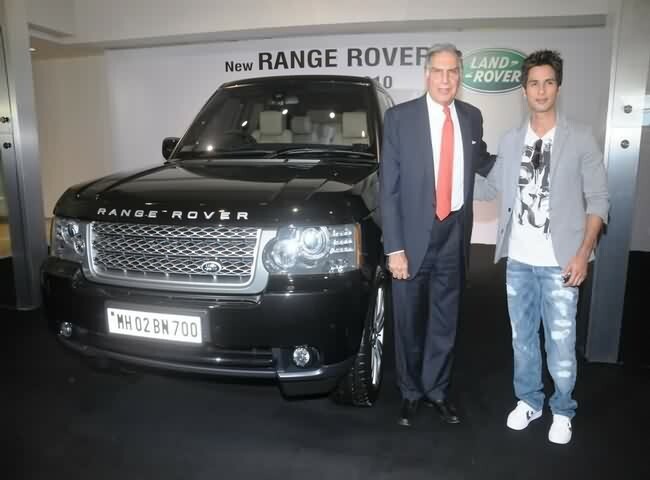 Hrithik Roshan : Jaguar Xj Black Edition, BMW in White Color, Range Rover Sport, Porsche Cayenne, Jaguar XJ, Mercedes Benz S500. Imran Khan : Porsche cayenne, Ferrari FF in Red and a Limousine by BMW. John Abraham : Audi Q7 SUV, Maruti Gypsy, Audi A7,Lamborghini Gallardo LP550-2. Kareena Kapoor : Lexus LX 470, Mercedes Benz W221 S350 CDI. Katrina Kaif : White SUV Audi Q7,Audi Q3. Kangana Ranaut : BMW 7. Koena Mitra : Ford Endeavour. Priyanka Chopara : Rolls Royce Ghost, BMW 7 Series White Edition, BMW 7 Series, Porsche Cayenne, Mercedes Benz E-class. Ranveer Singh : Jaguar XJ – CAR SUTRA Black Edition. Ranbir Kapoor : Range Rover, 2 Seater Audi R8 (Type 42), Mercedes-Benz G63 AMG. Ritesh Deshmukh : Mercedes W221 S Class. Sunil Shetty : Hummer H3. Shraddha Kapoor : A black color Mercedes-Benz’s SUV. Sunny Leone : A shiny black color BMW. Salman Khan : Land Rover Vogue,Audi Q7, Audi A8 and R8, BMW X6,The Mercedes-Benz, Toyota Land Cruiser and a SUV. Shahrukh Khan : Rolls Royce, Mitsubishi Pajero, Land Cruiser, Audi Q6, BMW 7 Series, BMW 6 Series, BMW convertible,Bentley Continental GT, Mitsubishi Pajero SUV, Rolls Royce Phantom. Sanjay Dutt : Rolls Royce Ghost, Red Color Ferrari 599, Bentley, 2 Seater Audi R8 and Q7, Audi A8, Lexus SUV, BMW 7 Series, Mercedes Benz M-class Porsche SUV, Toyota Land Cruiser. Shahid Kapoor : Black Range Rover Vogue, White Mercedes Benz. Shilpa Shetty : Lamborghini, Mercedes. Saif Ali Khan : Low Range Strong Car like Ambassador, Range Rover Sport, BMW 7 Series Sedan, American Mustang, Land Cruiser, Lexus 470, Audi Spyder R8 in Red Color, Mini Cooper and an Esteem by Maruti. Varun Dhawan : Audi Q7 in bluish black color. Zayed Khan : Toyota custom made car. A R Rehman (Music Composer, Singer) : Toyota Etios. Anoop Menon : Jaguar XF. Allu Arjun : BMW X6. Ajith : E65 BMW 7 Series. Asif Ali : BMW X3. Biju Menon : Range Rover Evoque. Biju Pappan : Toyota Land Cruiser, Harley Davidson Iron 833. Chiranjeevi’s : Rolls Royce Phantom. Dulquer Salman : Mini Cooper S.
Fahad Fazil : Volvo S60, BMW X6. Harris Jayaraj : Lamborghini Gallardo Bicolore. Indarjith : BMW 520d F10. Kavya Madhavan : BMW 5 series. Mahesh Babu : Range Rover Vouge, Caravan, TLC. Meera Jasmine : Mini Cooper. Mamta Mohandas : Audi A6. Nagarjuna : Nissan R35 GTR. Nandamuri Balakrishna : Porsche Panamera. Namitha : BMW 3 series. Prithviraj : Audi Q7,Porsche Cayenne. Ram Charan Theja : Aston Martin Vantage V8. Rambha : BMW 7 series. Santhanam : Range Rover Evoque. Siddique : Range Rover Evoque. Shwetha Menon : Mercedes C class. Yuva Shankar Raja : Aston Martin Vantage V8,BMW 6 Series. Mukesh Ambani (Reliance Group) : Owns Maybach 62, Mercedes S class, Black Mercedes SL500 and about 168 more cars. Anil Ambani (Reliance Group) : Lamborghini Gallardo, Mercedes S class, Lexus SUV, Mercedes GLK350, BMW 7 Series,Audi Q7, Rolls Royce, Maybach, Porsche. Gautam Singhania ( Raymond Group) : Honda S2000, Lotus Elise convertible, Ferrari 458 Italia, Verde Ithaca LP570 Superleggera,Lamborghini Gallardo, Audi Q7, Nissan Skyline GTR. Vijay Mallya (Kingfisher Group) : Jaguar Sport XJR 15, BMW M1, Rolls Royce Ghost, Chevrolet Corvette,Ferrari 365, California Spyder, Shelby America Cobra 427. Ratan Tata (Tata Group) : Ferrari California, Cadillac XLR, Maserati Quattroporte, Mercedes SL500, Land Rover Freelander, Chrysler Sebring. Sachin Tendulkar : BMW Individual 1 Series, Nissan Egoist GT-R, Ferrari. Virendra Sehwag : Bentley Continental Flying Spur. Yuvraj Singh : Porsche 911, Lamborghini Murcielago, Audi A8L, BMW M5. MS Dhoni : Hummer, Scorpio, Mitsubishi Pajero. Harbhajan Singh : Hummer, Ford Endeavor. Virat Kohli : AUDI R8. Sourav Ganguly : Mercedes Benz CLK convertible, Audi. Rahul Dravid : Hyundai Tucson SUV. Gautam Gambhir : Toyota Corolla, Maruti SX4, Hyundai Santro, 1,600cc Formula Ford Car. Saina Nehwal (Indian Badminton Player ) : BMW 3 Series, BMW X6. Ram Kapoor : BMW, Porsche. Ronit Roy : Audi Q7. Kapil Sharma : Range Rover Evoque. Rithvik Dhanjani : Renault Duster. Karan Wahi : BMW 5 Series. Manish Paul : Audi Q5. Karan Kundra : BMW 5 series. Karan Tacker : Red Audi. Gautam Rode : White Mercede. Sunil Grover : BMW 5 series. Mohit Raina : Ford Endeavour. Kushal Tandon : BMW 5 Series. Note: For all these celebrities and actors, Cars is not just a luxury to need, Its also a style icon too. So, i am sure they might be changing their vehicle, Purchasing new one etc. We listed this in 2011 to 2014 and few might already been outdated, Yet you can add your comments with any updates if seen any Bollywood actors and anyone listed above seen in any other car in Mumbai location..
See Also : Home Address Of Bollywood Actors.